The friend we were traveling with for a while wanted to check out the Descend On Bend gathering. We decided to let him pay the $75 fee (the cheapest ticket package, they go up from there), be our BETA tester and let us know what he thought while we hung out in the general area for the low, low price of Free. 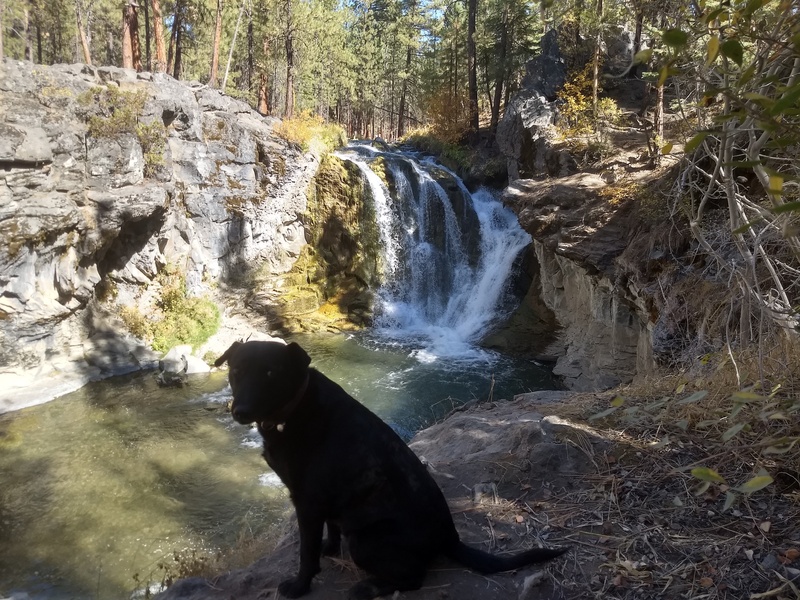 We left our last camping spot outside of Sunriver, OR and headed south towards La Pine. The Descend gathering started on a Thursday and we arrived in the area on Wednesday, the day after our grand 11+ mile hike to all those waterfalls and the lake and a spring. Since our buddy travels in a converted school bus he has an amazingly low ground clearance and gets worse gas mileage than we do in the Tacoma (I know, can you believe it) and so we did him a solid and checked out several overnight camping options along Highway 21 that his bus could get to. After checking out three campsites and two sno-parks we sent him to Six Mile Sno-Park as it was only a few miles up the road, it was right off the highway and it was a paved entrance and parking area so he could keep his freshly-washed skoolie looking good for the gathering as he is a bit of a youtube celebrity and has to make a good first impression. 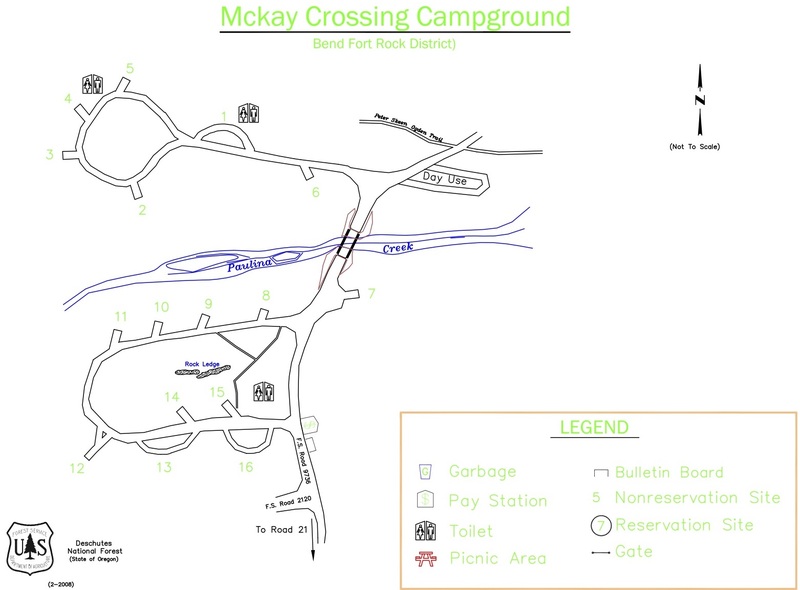 Between all those choices we decided that the McKay Crossing Campground would meet our needs for several days, especially since another waterfall would keep in the spirit of the last few days of our adventures. We had heard the possibility that this campsite might be “off-season” and so we wouldn’t have to pay. After a little over 2 miles of dirt, lightly washboarded road we arrived at the campground entrance and were delighted to see that in fact the informational bulletin board had been stripped of all official paperwork, the payment envelopes were gone as was the steel tube you would normally drop the envelope into. Score! Just past that bulletin board on the left was a small sign pointing the way to nine of the ten campsites on this side of Paulina Creek as well as access to the waterfall itself. We took a slow drive around the campsite loop (no one was there) and then parked and took the 50 meter walk to check out McKay Waterfall. We still had the campsites on the north side of the creek to check out before we made our decision on which one to choose for the next several days and so walked back to the Tacoma and drove across the little, metal bridge and chose site #2. Besides the people staying in spot #7 the rest of the campground was empty. Site #2 seemed to be as far away from them as possible with the added bonus of being the closest to the waterfall! From the signs, survey tape and slash piles left around we could tell that some company had just finished their small(er)-scale logging operation in and around the campsite. They did a pretty good job thinning out smaller trees in the campground itself but left more than a few 3″-4″ diameter stumps sticking 3″-8″ out of the ground which can be a real danger. Once we had set up camp I pulled out my small, folding pruning saw, spent about 30 minutes and went about cutting those vicious little toe and shin smackers down to ground level. 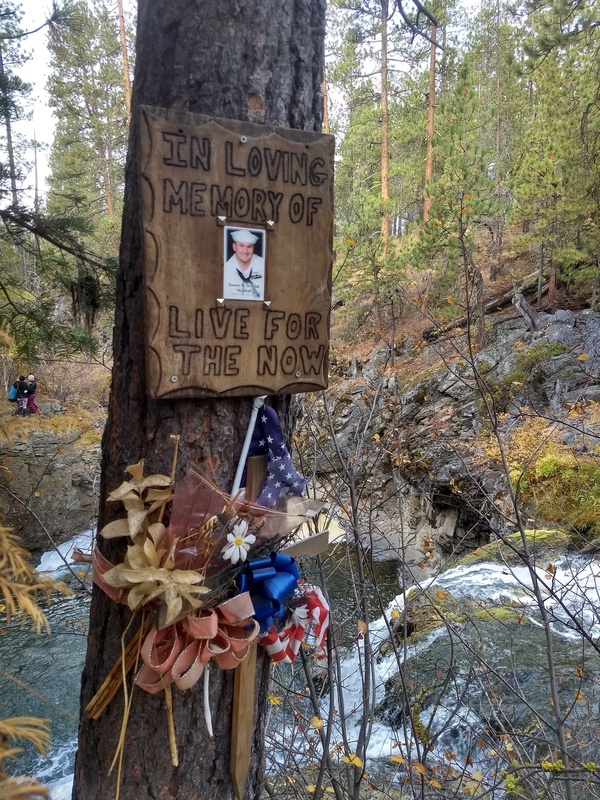 Once situated we took a more thorough look around and came across this memorial sign posted on a tree at the top of the falls. My cynical nature being what it is and with him having the nickname “Meatball” my first thought was that he was drunk and fell from here onto the rocks below or drowned and “What a Dummy.” Deciding to try out a more compassionate attitude and to solve this little mystery I did a little online digging. With his name and death date I found his obituary but that did not list a cause of death. It did though mention that he had died in Philadelphia, PA. Reading some online memorials to him it was mentioned that he was a welder’s assistant for a railroad company. 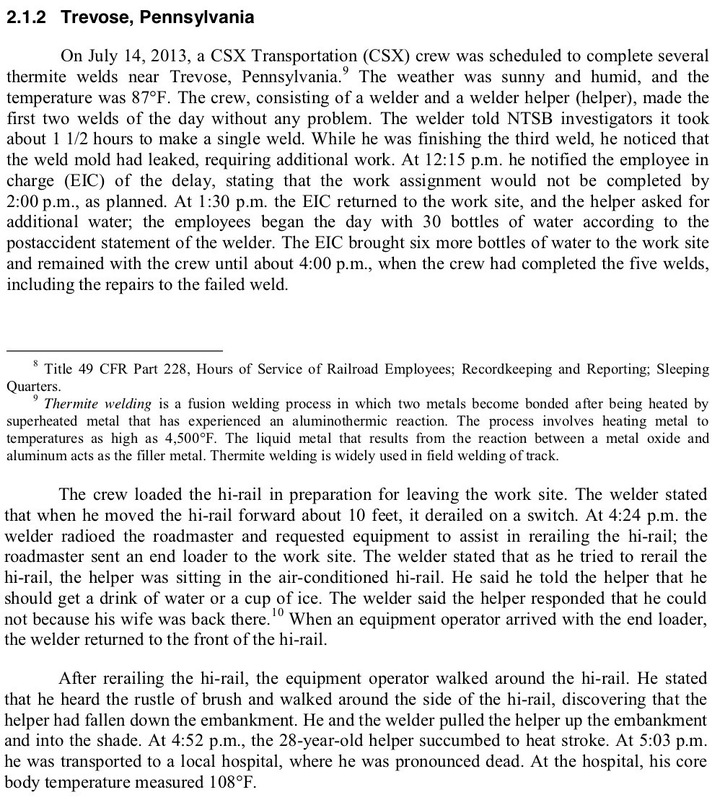 Now, looking for a railroad welder who died on that date we found the details in an NTSB report entitled “Special Investigation Report on Railroad and Rail Transit Roadway Worker Protection.” In section 2, “Roadway Worker Fatalities in 2013” we found out the details of how Jeremy M. (Meatball) Westfall, U.S. Navy Veteran, had died of heatstroke. The reasoning for this little memorial sign being placed here, I do not know. Was he from the area or just visited and had a good time here? Why did I spend about an hour tracking that information down? The answer to that last question I do know. At this point in my life I have grown out of being afraid of “asking dumb questions” or worrying that wanting to know some bit of information might be offensive or upsetting…I just want to know the answer. So… now that I figured out what I wanted to know and that my first assumption about how he died had been proven wildly incorrect I mentally apologized to the deceased for thinking so poorly of him and decided to try to be less knee-jerk judgemental in the future… and then decided to forgive my momentary douchy attitude and have a nice, local IPA before going on a hike with Willow along Paulina Creek. 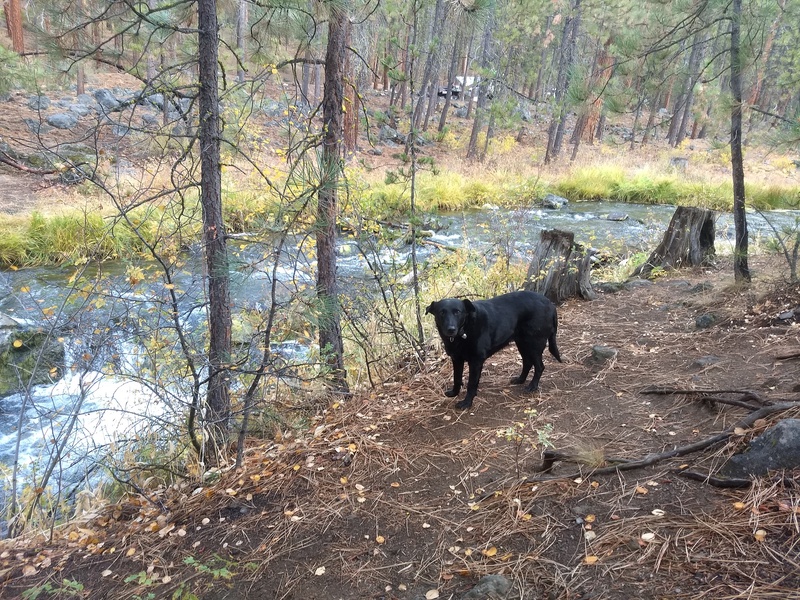 We did a 2-mile loop by first paralleling the creek for a ways upstream (East), cutting up into the forest behind the campground and then back around to our campsite. As we were walking back down the little earthen rise on the North side of the campground towards our spot Willow spotted a red, Dodge pickup parked on the road along our little end loop and alerted me to its presence (she’s not a fan of Dodge). As we walked the last 50 meters into that road loop the person in the Dodge saw us, got out and starts walking towards us which immediately puts my girl into high alert/wariness mode. 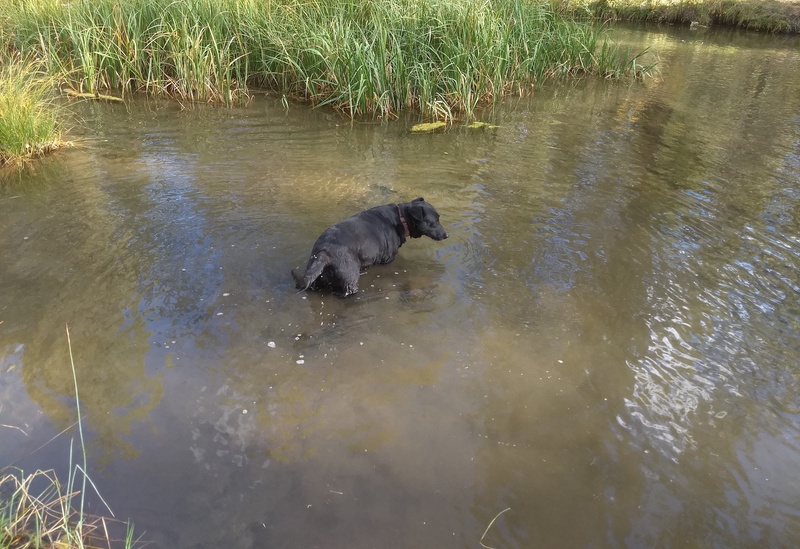 Her low growls abruptly halted after I give her the “Easy” command and we soon found out he was just scouting out the area for deer rifle hunting season which was going to begin the next day. He asked if we had seen any deer (we had not) but that we expected that was due to the recently ended logging activity right here. He thanked us, drove away and we didn’t think much more of it except to wonder if anyone would be so wreckless as to hunt in the actual campground. Would they? The next morning we were both awoken by a loud BOOM at 6:59 on the dot (I looked at my phone). Too close and obviously well within the boundaries of the campground but we were certainly not going to rouse ourselves completely and go out to investigate. Two hours later after a relaxed morning of coffee and catching up on the news we set out towards the other end of the campsite to see what we could find. But again, nobody would be so stupid as to actually hunt IN the campground…right? 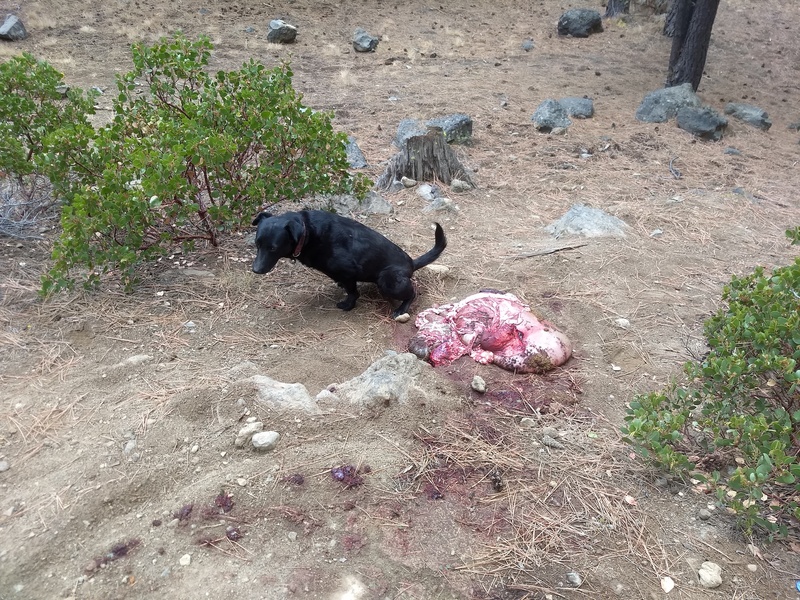 We found a gut pile all of five feet off the Peter Skene Ogden trailhead named after the 19th century Canadian fur trader and explorer who the town of Ogden, Utah is also named after. 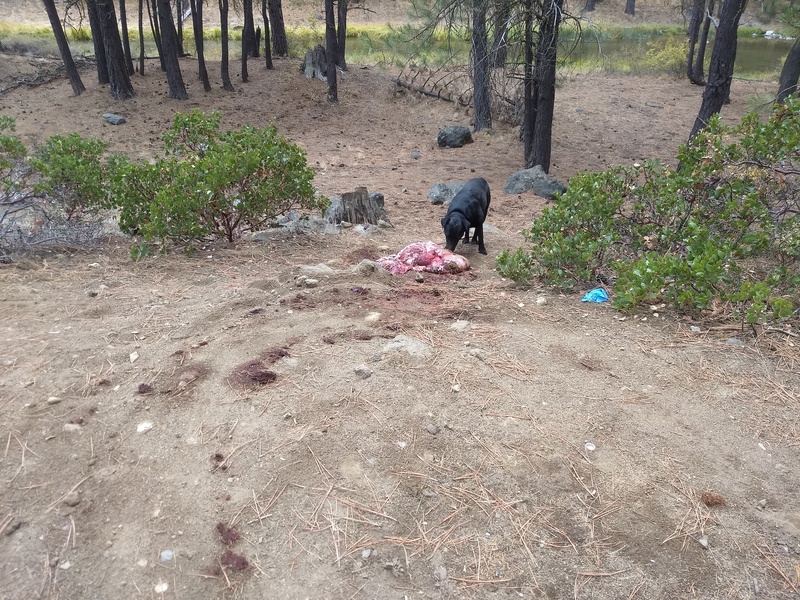 Besides doing a poor job butchering the animal by cutting open its stomach and having that bacteria-laden mush contaminate the meat the hunter also left the gut pile to rot right there along the trail while leaving one of his blue nitrile gloves in the bushes so…a truly poor job and he should have his license revoked for such sloppy work. Dummy. Willow didn’t seem to mind as she peed several times around the pile to make her presence known and claim it all for herself. 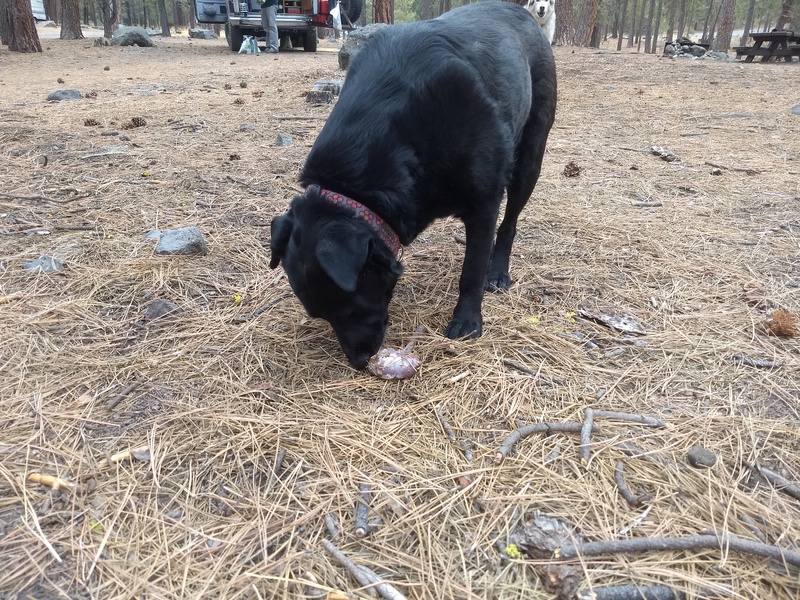 Then, without me noticing, she decided to take a kidney for a future snack which I didn’t find out about until I saw her laying down back in camp sniffing and licking something very enthusiastically and found her guarding this prize. 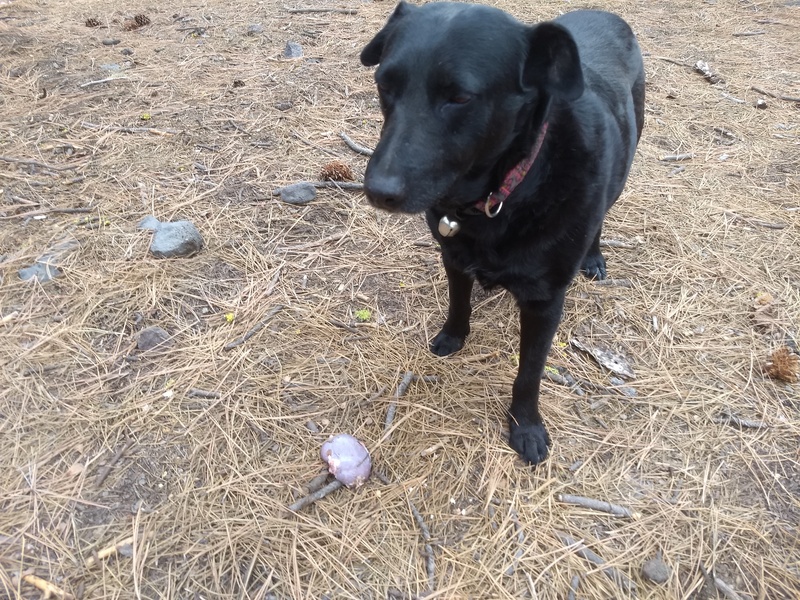 Willow eats some relatively high-end dry dog kibble (Instinct Raw Boost) but her formative years spent on the Navajo Reservation leads me to believe that she grew up eating garbage, dead things and any small creatures she could chase down. Just so you know a treat like this is not, at all, a normal part of the diet that I provide for her. 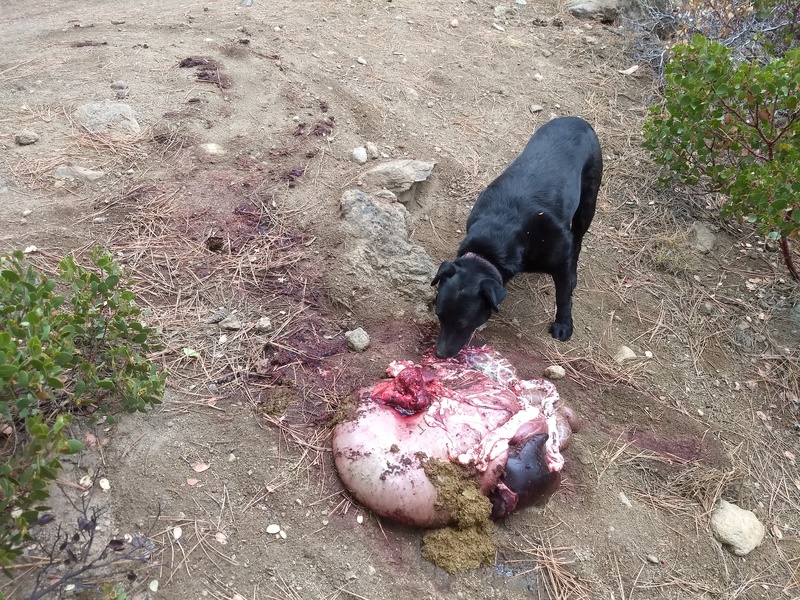 That being said organ meats are the most nutrient-dense part of the animal so I really have no problem with her supplementing her diet with the very occasional small mammal she expends calories to catch or something like this fresh kidney from a wild animal. Just no kisses for the rest of the day and I’ll have to leave the windows on the camper shell open because she was going to be a stinky, farty girl that evening. PS – she really really was! For the next couple of days we took two hikes a day, caught up on reading and were friendly to the handful of people who drove through the campground and the few who actually stayed to camp. One couple showed up with a big floof of a malamute named Harvey and he and Willow got along great. One of their favorite pastimes was trying to dig out the ground squirrels under old tree trunks. Our friend came back on Sunday after Descend On Bend ended and we headed back out towards our next adventure the following Thursday. According to the Hoodoo Recreation webpage (the company that runs this campground and some others for the National Forest Service) this site closes for the season on October 1st or earlier (depending on the weather) but when we departed on October 4th there was no activity which indicated its imminent closure. Still, if you plan on visiting the area you definitely should check online or call ahead to make sure this is open before you arrive. The Prairie Campground is about 3 miles away (just across Highway 97 from where we entered the dirt Forest Service Road to get to McKay Crossing) and it was closed for the season during the third week of September when we were first sniffing around.